Jonathan Calugi x Alfa Romeo at Mille Miglia 2014 from MACHAS on Vimeo. 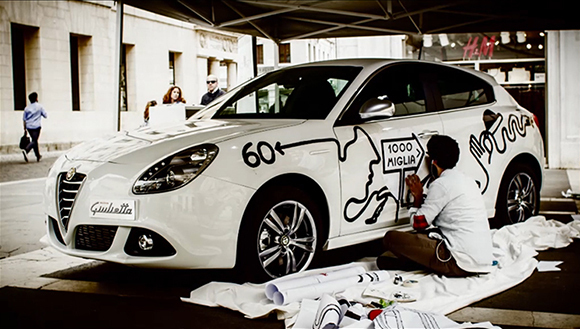 60 years of passion, anecdotes, technological innovations which have established the myth of Alfa Romeo’s Giulietta have been represented on the coupé’s bodywork by Jonathan Calugi. 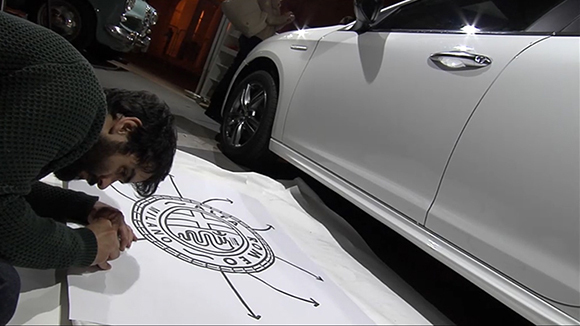 In occasion of the Mille Miglia historic race, one of the world’s most renowned vintage car parades, Alfa Romeo asked Jonathan to identify the key elements of Giulietta’s rich history and illustrate them with his trademark one-line style — this time not digitally but live in front of the curious public who could stop by and interact with the artist himself. Jonathan is well known for his vector art but he’s surely not one to focus on one medium only and was extremely excited at the idea of going analog for this project. “I’m constantly exploring new venues to express my approach to design and to push my comfort threshold even further”, says Jonathan. “The main challenge of the project was to recreate the essential sleekness of the vector line whilst retaining the charme of the freehand trait. It might be because I’m from Tuscany but I opted for the dusting technique, which was used quite frequently during the Reinassance period, mostly for frescos and ceramics.